This island hopping holiday combines a stay on the diverse island of St Lucia, full of culture, dramatic landscapes and adventure, with a relaxing stay on a private island resort in the Grenadines. 12 nights from £3445 per person including all flights and transfers. Sample price is for travel in low season, staying in the lowest room type and include current special offers. Begin your island hopping holiday by flying to St Lucia, where you travel by car to Calabash Cove Resort & Spa on the north-west coast. 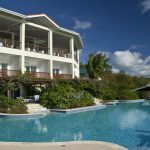 Calabash Cove is a romantic, boutique resort set on a hillside which leads down towards the ocean and a small beach. 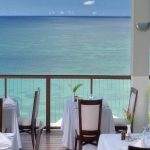 Dining options include a fine dining restaurant and more relaxed bars, while the spa offers a range of pampering treatments. Guests staying at Calabash Cove can easily visit Castries, the island’s capital which is just 10 minutes away by car. Here they will find plenty of bars and restaurants as well as an excellent market selling local crafts and souvenirs. St Lucia Golf & Country Club is also just a short distance away, set amid rolling hills in the far north of the island with panoramic views. Visitors to St Lucia can take part in a fantastic range of activities or simply relax and enjoy the stunning scenery which includes volcanic peaks, lush tropical forests and plenty of beaches. Those looking for an adrenaline filled holiday can scuba dive in a marine park, hike in the mountains, zipline through the rainforest or hire a jeep to explore. Places of interest include Soufriere Sulphur Springs, Pigeon Island National Park, the Fond Estate and the Diamond Falls Botanical Gardens. Find out more about things to do in St Lucia. After five nights in St Lucia, take a local flight to Union Island in the Grenadines then onwards to Palm Island by boat, a journey of about 10 minutes. Palm Island is a private island resort which offers a laid back, luxurious and exclusive experience. Most of the rooms and suites occupy the western portion of the island, allowing guests can enjoy lovely views of the sea or gardens from their private terrace or deck. Two restaurants serve a range of cuisine, with private picnics available on one of the more isolated beaches for a special experience. A new beachfront spa offers a range of relaxing wellness and beauty treatments. Days can be spend on the beach or by the pool, or those who prefer to be active can snorkel in the warm Caribbean waters, hike or cycle along the island’s trails, or take part in non-motorised water sports. Due to Palm Island’s location in the heart of the Grenadines, guests are in a prime position to visit the surrounding islands – possible excursions include boat trips and visits to the Tobago Cays which offer world renowned snorkelling. 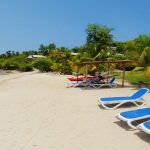 Spend seven days relaxing on Palm Island, then return by boat to Union Island, take a local flight to St Lucia then onwards to the UK. 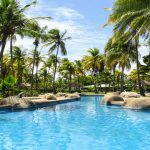 Return flights with Virgin Atlantic or British Airways in Economy from London Gatwick to St Lucia. Return inter-island flights with a local airline from St Lucia to Union Island. 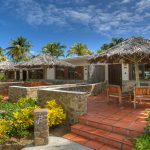 5 nights’ bed and breakfast at Calabash Cove in St Lucia sharing a Sunset Ocean View Junior Suite. 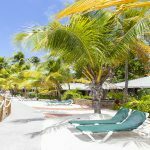 12 nights’ all-inclusive at Palm Island in the Grenadines sharing a Palm View Room.